We love Lego. That might even be an understatement. As a family we look for new subscription boxes that will deliver fun things we enjoy. A while back I got a free box to review. We decided to buy this subscription box three months ago. 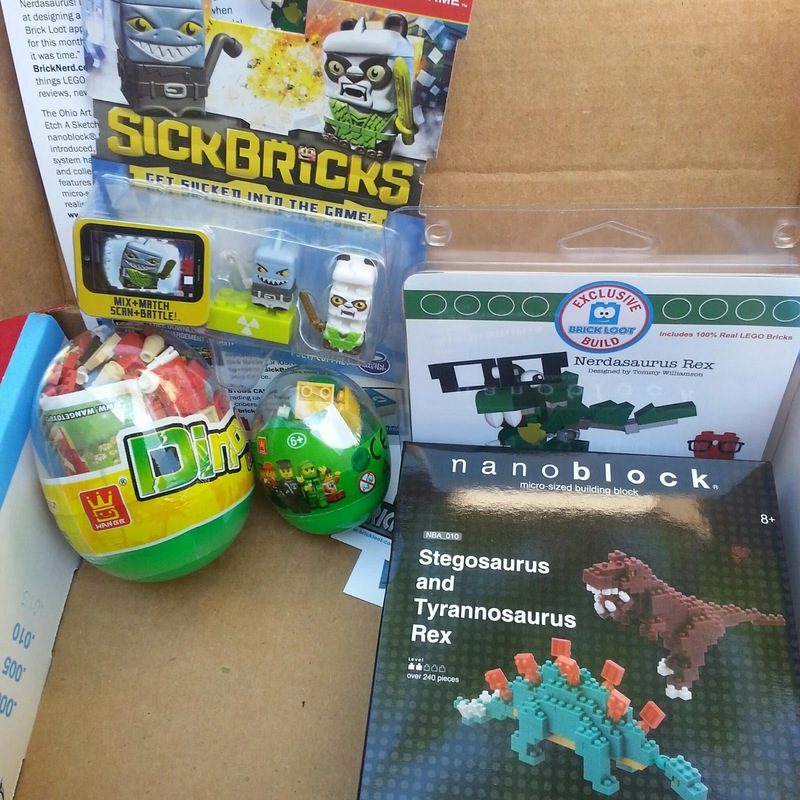 June's Brick Loot theme was Brickasaurus. Our favorite so far. Nerdasaurus was a super cute custom build. I like the custom builds because they come with real Lego bricks. Nanoblock are really tiny but fun. They allow for realistic creations. Fun fact that I never knew: same company that made Etch a Sketch. Who didn't love that? The hatching animals came in eggs. Which since the YouTube craze of egg openings, my kids dug this. It also came with Sick Bricks. My son already started playing this game. It's a cool concept. Beam them up and play the characters in game. My only pet peeve with it is if the beam doesn't work. You need good lighting and plain background for it to work. Our overall happiness level for this month would be a 10. Noah says, "It was the best." We have the 1 month subscription plan which comes to $33.00 after shipping. I love ALL of this! I'm a huge Lego geek, too! What a fun box.